Sound "The sonic effect of the Craz 4 Reference required no straining to hear or creativity to explain. This rack helped produce a deeper, more profound kind of clarity that brought me into the recording more readily, likely because a fine dusting of noise that normally overlays the signal was vacuumed up." "Suddenly, more of the music is present. The Craz 4 Reference is the audio equivalent of Mr. Clean." They act as sinks for vibration and resonance, quickly draining these from the components that sit atop them." "The Craz 4 Reference is actually a rack within a rack. What the wood hides is a skeleton of titanium tubing that essentially supports everything that's seen." Use The Craz 4 Reference is "load and application specific"; "changing audio components requires some reconfiguring to ensure the maximum effectiveness of the rack." Value The Craz 4 Reference is "very expensive" but it "displays all of the design acumen, craftsmanship, and performance to put it among the best equipment racks available today." At what point in the history of high-end audio did the rack on which we audiophiles place our equipment morph from something merely functional into a product that contributes to the sound our audio systems produce? Exploring this question -- and the products to which it led -- could be the basis for your doctoral dissertation in industrial design. You wont be able to rely on the Internet as a reference -- not enough history there. Youll have to pore over dusty audio-related print mags, and likely their ads instead of their reviews. By and large, audio reviewers devote their time to speakers and electronics -- the glamour items -- and not isolation platforms and equipment racks. Heck, thats almost furniture. At some point during your research, youll want to schedule some time to talk with Kevin Tellekamp, the good-natured head of Silent Running Audio. While his Craz 4 Reference isoRack Plus was not the first audio rack designed with better sonics in mind, it is surely one of the most fascinating examples available today. And as I discovered, it just plain works. When you look at the Craz 4 Reference, you see a beautiful thing -- grainy hardwood, dovetail joints, composite stone-like shelves, discriminating proportions, attention to detail. What you dont see is the method to Kevin Tellekamps design madness. Needless to say, much more is going on with this rack than meets the eye -- and there is a lot that meets the eye. The Craz 4 Reference is actually a rack within a rack. What the wood hides is a skeleton of titanium tubing that essentially supports everything that's seen. The titanium tubes are tuned with a series of compounds that Silent Running chose via computer modeling, and they interconnect within the wooden structure of the rack. They are inserted into the wood via holes that are drilled the entire length of each support piece. The machining is done on a five-axis CNC router, which makes for extremely tight tolerances -- thousandths of an inch. To aid in inserting the titanium tubes, which has to be a difficult job, SRA freezes them. I know a little about woodworking, my dad having been a skilled carpenter, and I still have trouble wrapping my head around the complexity of just this part of the Craz 4 Reference's creation. Each 1 3/4"- or 2 3/4"-square wooden piece starts off as 12" blank that has air dried ("not kiln dried," Tellekamp is quick to point out) for 15 years. Hard white maple, sapele and cherry are the woods that SRA uses most often, but other dense woods are available on special order. However, "each of the standard woods can be made to look just like other woods," Kevin explained, which implies that actual use of many exotic woods is unnecessary. "We are building two units in sapele that will be bleached and stained, and will look exactly like teak when we are done." All the woods are hand picked, and SRA has separate sources for each species. Even so, "finding dimensional lumber that meets our needs is very difficult," Kevin complained. The Craz 4 Reference is about more than fanatical craftsmanship and solidity. 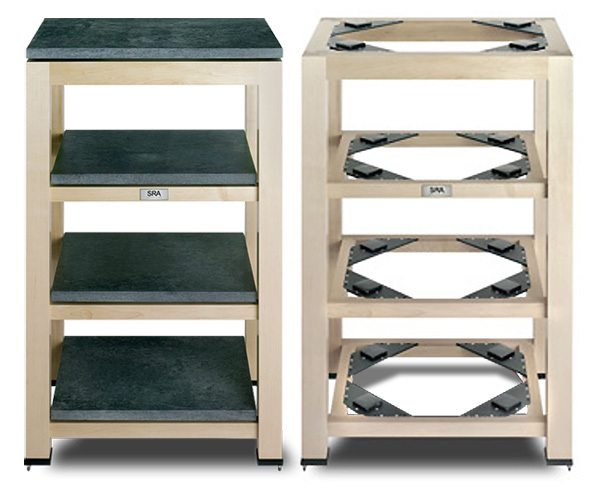 The rack's framework is only the most outward part of a multifaceted system for addressing vibration in audio components. The Craz 4 Reference employs just about every known principle: rigidity, mass loading, coupling, decoupling, multiple DOF (degrees of freedom) isolation, and mechanical chokes. The shelves, for instance, are made of a proprietary nano-particle composite material that is incredibly lively. When you tap on them, they ring in obvious fashion, which is the point. They act as sinks for vibration and resonance, quickly draining these from the components that sit atop them. They also mass load the entire rack, which weighs in at something over 300 pounds. SRA tested and tweaked the shelf composition for a year before finalizing its recipe. Kevin Tellekamp's take: "They [the shelves] would make Mr. Plumber happy with their ability to drain resonance at an almost alarming rate!" Each shelf sits on squishy black pods composed of a combination of acrylic and thermal-reactive urethanes that are stable over a great range of temperatures and humidity conditions. A rack in Pago Pago, therefore, will be as immune to its environment as one in Phoenix. The pods rest on cross braces of different materials that are chosen based on the application -- the equipment on each shelf. The most commonly used materials are titanium, T-6 aluminum, HY-80 high-tensile steel, or a blend of these. Thus, when the vibration and resonance from the component makes its way to the lively shelf, the pods are underneath ready to damp it so it's not sent back into the component or to the frame of the rack itself. As with Silent Running's Ohio Class XL Plus2 equipment platforms, the pods are load and application specific, so different audio components require different pods and possibly different cross braces as well. Unfortunately, this also means that changing audio components requires some reconfiguring to ensure the maximum effectiveness of the rack. The Craz 4 Reference ($7500 USD) measures 48"H x 30W x 22"D and has 11" or so between shelves. It will accommodate one standard-size component per shelf (or two narrow ones), including large amplifiers. The Craz 8 Reference ($8500), a double-width version of the Craz 4 Reference, will accommodate at least two components per tier. These are the two standard models that Silent Running makes, although custom configurations are possible. "We never really wanted to build equipment racks, but always had a hard time racking our own gear," Kevin told me. "We tested everything out there, and then started getting big-time pressure from one of our best customers, who basically said if we did not build a rack for him, he was going to 'cut us off.' Nothing like a little extortion!" Hey, whatever gets the job done. The Craz 4 that I received came in two crates: one in which the rack itself fit as snug as a bug and another for the shelves with an ingenious system of braces for protecting the cargo. It reminded me of a puzzle box (for you Antiques Roadshow watchers) because of the way the supporting materials fit into place. Moving the rack without shelves is a workout, as is getting it out of its wooden shipping cocoon. Even though the maple review sample was a show-demo unit, it looked to be in very good cosmetic shape, a testament to Silent Running's crates and packing. The crates were battered and beaten, but what was inside was not. I'm sure these racks get busted up in transport -- what's inside each crate is big and heavy, making damage all the more likely -- but it will take some extreme ham-handedness to do it. The Craz 4 Reference became the literal centerpiece of my audio system. On it sat a profusion of fine electronics, including an Audio Research Reference 3 preamp and Reference CD7 CD player, an Aurum Acoustics Integris CDP CD player/preamp, an Ayre C-5xe universal player, and an Esoteric P-03 transport and D-03 DAC. These products represented very different loads -- from around 25 pounds for the Ayre and Aurum Acoustics units, to over 60 pounds for the Esoteric separates. The rack I received to write about came from CES, where it was used with yet different loads. What I'm driving at is that the review rack, while having all of its necessary parts, wasn't adjusted for the specific load of each piece of equipment I used, which is how new Craz 4 References are delivered. I definitely heard some specific improvements while I used the rack, but these probably would have been greater still had the Craz 4 Reference been properly tweaked. I may report on the effect of such fine-tuning at some point in the future. Speakers were Wilson Audio Alexandria X-2s and Sophia 2s, Magnepan MG20.1/Rs, and near the end of my listening (i.e., as I was writing my review) Verity Audio Parsifal Ovations. Cables were primarily Shunyata Research Antares Helix interconnects and Orion Helix speaker cables, with a complete set of Crystal Cable's new Ultra interconnects and speaker cables showing up a few days before the Verity speakers. Power cords were all from Shunyata Research: Python Helix Alpha and Vx, and Anaconda Helix Alpha and Vx. All were plugged into a Shunyata Hydra Model-8, which itself connects to the wall outlet via an Anaconda Helix Alpha cord. The Craz 4 Reference took the place of a pair of Michael Green Design racks, which replaced a pair of basic Target TT4 racks a few years ago. Normally, I would compare the Craz 4 Reference to the MGD racks and perhaps even the Target racks, both of which I lived with for years. However, in terms of sonic result, there is no comparison: The Craz 4 Reference wiped the others, which, to my ears, produced little or no discernible change in sound -- let alone improvement. The Craz 4 Reference, on the other hand, not only produced a very recognizable difference in the sound of my system, but also one that was completely for the better. Besides, comparing the sonic fine points of equipment racks has to be one of the things that evil audio reviewers do as penance. The only thing I can think of that would be more tedious would be watching a multi-DVD set of Josh Groban concerts beginning to end. No offense to Kevin Tellekamp, of course, who does undertake such drudgery (comparing racks, materials and such, not watching Josh Groban DVDs). You are a more patient man than I, Kevin. How does one review an audio rack? This is the question I was grappling with after I agreed to write about the Craz 4 Reference. A rack has no drivers or tubes, no inputs or outputs, no power cord or remote control. It's something you see long before you hear it -- if you are able to hear it at all. The truth of the matter is that all racks are not the same. Some are merely household furnishings, and others are designed just as electronics and speakers are designed, and built with just as much care. The Craz 4 Reference belongs to this latter group, and not just because of the many theories behind it or its cost. It effects a very recognizable set of sonic improvements, proving not only its worth in terms of sound, but the relevancy of the notion that a finely wrought equipment rack can be considered an integral part of an audio system. As with the Silent Running Ohio Class XL Plus2 platforms I wrote about earlier this year, the sonic effect of the Craz 4 Reference required no straining to hear or creativity to explain. This rack helped produce a deeper, more profound kind of clarity that brought me into the recording more readily, likely because a fine dusting of noise that normally overlays the signal was vacuumed up. First and foremost, this is what equipment racks and platforms do -- when they do anything, that is. They are subtractive by nature, removing the self-generated noise of the circuits and the harmful influence of the physical environment. You don't know how much this gets in the way of the music until you've put your electronics on a rack like the Craz 4 Reference. Immediacy and clarity are improved, but ultimately the signal is in a purer state, one that's less tangled with the grunge that you've come to believe is part of your system's sound. Suddenly, more of the music is present. The Craz 4 Reference is the audio equivalent of Mr. Clean. On the other hand, too much Mr. Clean is a bad thing, creating a stark, uptight presentation from which the personality of the music has been scoured away. The Craz 4 Reference doesn't kill the music as it addresses vibration and resonance. As with the Ohio Class XL Plus2 platforms, bass weight and control were improved, as were my system's dynamics and soundstaging. Tonal color was, if anything, more vibrant; piano especially benefited from the Craz 4 Reference's abilities. I seek out piano-trio recordings, and a recent find is the Blue Note disc of Elmo Hope sets from 1953, 1954 and 1957, Trio and Quintet [Blue Note 0946 3 11498 2 5]. This music sounds alive 50 years after it was recorded. I had listened to this CD extensively before the Craz 4 Reference arrived, and then immediately after. Hope's playing had a glowing vitality once the Craz 4 Reference was supporting my preamp and CD player, and while no one would mistake Trio and Quintet for a modern recording, my personal "Who cares?" control was set at 11. This is indispensable music, and the Craz 4 Reference helped it sound more direct. I heard more of the recording's essential quality -- it's encoded on the CD, after all -- and more of the music's subtleties, too. But "more" can be a tradeoff. "More" detail sometimes means "more" of the noise that clings to it as well. Not with the Craz 4 Reference. "More" translates to "better." I wouldn't call Trio and Quintet an audiophile favorite, but Patricia Barber's Modern Cool [Premonition Records PREM-741-2] certainly qualifies. This demonstration war-horse benefited from the Craz 4 Reference's noise scrubbing just as much as lesser recordings, taking on the same kind of vibrancy and directness, but also showing that midrange presence and bass weight were also enhanced. In fact, there was really nothing about the sound of my system that wasn't at least a little better -- and sometimes much better -- with the Craz 4 Reference. And it's a rack -- not a new speaker or amp! This might be the highest hurdle for the Craz 4 to clear -- the perception that only what's in a metal chassis or veneered cabinet can influence sound in a meaningful way. And even after you've become accustomed to this rack's magic, it's easy to forget. You don't have to unplug the rack when a thunderstorm is looming, and you don't have to replace its tubes. The Craz 4 Reference just sits there, as patient as a donkey, making an audio system sound more like it would in a perfect world. Now, the downside. The Craz 4 Reference isoRack Plus is very expensive. It also has a mouthful of a name. These things aside, I simply can't fault what is probably Kevin Tellekamp's best creation so far. This is not something I write easily given my lavish praise for his Ohio Class XL Plus2 platforms, which are the first such products we've ever named Reviewers' Choice. The Craz 4 Reference equals what the platforms do so well. It uncovers more of the essential nature of the components resting on it and the recordings played through them. Don't think bland or bleached sound; instead, you'll hear more of what makes you a close listener of music to begin with: beauty, emotion, drama, power, dynamics, and detail. 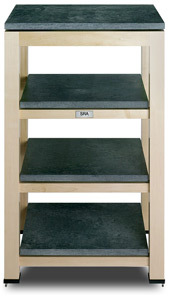 I don't have enough experience to know if the Craz 4 Reference is a state-of-the-art rack, or the best on the market. It's the only truly effective one I've considered at length, and there are others from Harmonic Resolution Systems and Symposium in particular that look to be just as expertly designed. Even so, I am confident in saying that the Craz 4 Reference displays all of the design acumen, craftsmanship, and performance to put it among the best equipment racks available today. After you've finished your dissertation and people start calling you "doctor," you should hear your audio gear on a Craz 4 Reference. Pay up your student loans first, because you'll want to write a check for it.